School Health Program is one of the important components of total Health Care Delivery System in a State, which helps in keeping close watch on the health of school going children. Primary eye care comprises a simple but comprehensive set of promotive, preventive and curative actions that can be carried out by suitably trained primary health workers, specialized auxiliary personnel or other interested people. It is a frontline activity, providing care and identifying disease before it becomes a serious medical issue. Primary eye care can be delivered in many different ways comprising the components such as eye health education, symptom identification, visual acuity measurement, basic eye examination, diagnosis and timely referral. The development and implementation of primary eye care activities depends on existing primary health care system. 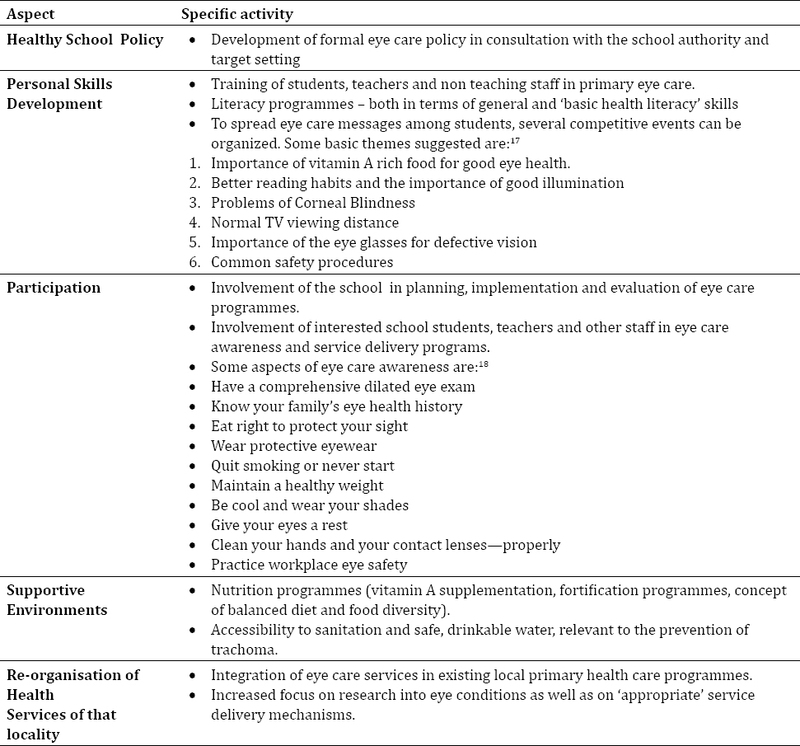 To implement the concept of primary eye care in schools, the teachers have to be trained to address the components mentioned above. Various nutritional deficiencies affecting the preschool children range from 4 per cent to 70 per cent. Developmental delays are common in early childhood and affect at least 10 percent of the children. These nutritional deficiencies and developmental delays if not intervened timely may lead to permanent disabilities including cognitive, hearing or vision impairment. Despite having good health indicators for the state, visual problems constitute up to 7.8% of the health problems according to the annual school health report for the state of Kerala. Investment in school health programs is the most efficient and cost effective way to improve students’ health and consequently their academic performances. Beside the students, teachers and other staff also get health benefits. In most regions of the world, approximately 50% of the children in schools for blind have blindness that could have been prevented. India is home to the largest number of blind children in the world and about half of them are preventable. Among the rural population of the economically backward states of Central India, childhood cataract, refractive error and vitamin A deficiency are the most common causes of childhood blindness. Most of the causes of childhood blindness are exacerbated by lack of community awareness. Ignorance and harmful traditional practices can unwittingly lead to blindness. Vision influences development of postural reflexes. Abnormal postural reflexes, faulty motor patterns and consequent postural and balance deficits may be seen in blind children. Posture and mobility go hand in hand. Children learn body language by observing their friends and family. Blind children cannot observe and learn such normal mannerisms and exhibit faulty motor patterns through inappropriate gestures, facial expressions, eye movements, lack of coordination in gait (visual ataxia), rigid inability to change position associated with fear and body stiffening (freezing), etc. which further predispose to postural abnormalities. Considering that 80% of what a child learns is processed through the visual system, good vision is critical to the child’s ability to participate in and benefit from educational experiences. Blind or visually impaired children are economically unproductive and they also consume 10% of the time of an economically productive member of their family. The global cost in “lost productivity” on account of avoidable distant vision impairment in the Southeast Asian region is $ 44.5 billion. In the light of these observations, it is felt that primary eye care services in schools should be developed as an integral part of the health care delivery system through changes in education policies. Worldwide 20-40 million children are estimated to have at least mild vitamin A deficiency (VAD) and half of them reside in India. VAD causes an estimated 60,000 children in India to go blind each year. They are a “captive” group and can be reached through the organized educational system. Reading and writing are their basic school level activities requiring good eyesight. Early detection and referral of children with eye problems is the key to timely provision of highly cost-effective interventions such as provision of glasses. School-based screening programs allow early detection of conditions that cannot be cured but require appropriate low vision services. Irritated, sore, light sensitive eyes significantly impede children’s ability to learn and may lead to the use of harmful practices, which can further damage the eyes. In some areas, eye morbidity represents a significant cause of school dropout. The detection and treatment of common eye conditions, such as conjunctivitis and lid infections are a critical part of child-centered comprehensive school health programs. Health education to reduce stigma associated with visual impairment or spectacle wear is another essential yet neglected aspect. Many school eye health initiatives focus on the detection and treatment of under-or un-corrected refractive errors (uRE) in school going children, with referral of those with other eye conditions. The limited focus of this type is not an efficient use of resources and does not address the eye health needs of teachers, children with other disabilities and those who are out of school. More than 80% of adults aged 40 years and above have presbyopia, many of whom are likely to be un-or under corrected. Presbyopia increases with increasing age, so that by the age of 50 years, 50% of people need spectacles to read or see near objects clearly which increases to 80% or more by the age of 60 years. A sizable number of teachers and other staff may be in this age bracket. This can have an impact on a teacher’s ability to prepare and mark school work. Diabetes is increasing in all regions. Up to 10% of people living with diabetes have sight threatening retinopathy that they are not aware of as this can be asymptomatic at the earlier stages. Glaucoma affects 4-5% of adults aged 40 years in African and Asian countries. Teachers having any kind of eye problem may be more interested in knowing and caring about eye diseases. All school health initiatives should include the eye health of teachers and other staff with approaches and aims towards extending the services to parents and family members of students as far as possible. Locally available personnel and training programs for primary health care can be used to promote and strengthen the delivery of eye care in the schools. The primary eye care worker from local public health care facility in collaboration with the trained school teachers should carry out promotive and preventive activities, focusing on education and students’ participation to prevent visual loss. The clinical activities involved in primary eye care consist of simple means of treating the three major eye symptoms presented by patients: inflamed (“red”) eyes, loss of vision and pain in the eye. In schools, the trained teacher alone or whenever necessary, with the help of the health worker can manage these problems by definitive treatment, by referral after immediate treatment or by referral alone. Teachers get opportunity to interact with their students daily. Hence, it is possible for them to observe the behavior of their students to facilitate early detection of vision defects. School teachers can ensure compliance on the advised corrective measures for eye diseases and use of spectacles among children who are provided with spectacles. School teachers can serve as good counselors to parents and students and motivate them to use spectacles and have good eye health habits. It is well known fact that correction of refractive errors improves academic performance and efficiency of the child. If teachers are trained to identify and refer eye diseases as per symptoms, workload on ophthalmic assistants and ophthalmologists will be reduced. Credibility of eye care services increases because teachers are in a trustworthy position in the society. Key health messages can be spread to community via school children (child-to-child approach) as they can also be used as case detectors. The proximity between the teacher and the students make the “school teacher” the most appropriate “primary screeners” for the vision screening programme among school children . Most of the diseases listed in the above three categories, managed by health care worker can be managed well by trained teachers. The teachers have to be in close contact with the health care worker of the local health facility for any help in initial treatment, recognition and referral. Under School Health Services the most visible activity is School Eye Screening (SES) program, which became the integral part of the National Program for Control of Blindness (NPCB) since 1994. Based on administrative, logistic, social and medical reasons, it is envisaged under the program to focus initially on screening of students in “middle and secondary schools” or schools having 5th to 10th standard students. The age of the pupils in these classes is around 10-14 years and they are able to understand the purpose and need for vision screening. The WHO also recommends the priority age group for vision screening as 11-15 years. The activities under SES program include identification of schools, collection of information on number of students and teachers, screening and referral centres, training of school teachers, training of general health care personnel, confirmation of “suspect” students by ophthalmic assistant or ophthalmologist, prescription of glasses, and provision of free glasses to students from poor socioeconomic strata. The children of 0-6 years age group are managed at District Early Intervention Center (DEIC) and 6-18 years age group at existing public health facilities. DEIC acts as referral linkages for both the age groups. Outreach screening is done by dedicated Mobile Health teams for 6 weeks to 6 years at anganwadi centres and 6-18 years children at school. Treatment for any child screened and referred from any of these points of identification is free of cost. Child Health Screening and Early Intervention Services under RBSK envisages to cover 30 selected health conditions for Screening, early detection and free management. Among these 30 health conditions, 5 are related to visual function directly or indirectly. Inclusion of health promotion component and adding other activities of primary eye care to the School Eye Screening (SES) will go a long way not only for eye care but for other health issues in school children. Any one from the school, such as students, teachers, and non-teaching staff diagnosed to be having any of the below listed diseases can be linked to the concerned national health programs as beneficiaries through the local health facility. Clare Gilbert, Hasan Minto, Priya Morjaria, Imran Khan. Standard Guidelines for comprehensive school eye health programme. Kong L, Fry M, Al-Samarraie M, Gilbert C, Steinkuller PG. An update on progress and the changing epidemiology of causes of childhood blindness worldwide. J AAPOS. 2012 Dec; 16(6):501-7. Smith TS, Frick KD, Holden BA, Fricke TR, Naidoo KS. Potential lost productivity resulting from the global burden of uncorrected refractive error. Bull World Health Organ. 2009 Jun; 87(6):431- 7.
WHO. Elimination of Avoidable Visual Disability Due to Refractive Errors: Report of an Informal Planning Meeting, Geneva, 3-5 July, 2000. Geneva: WHO; 2000.